Introducing one of the most versatile and effective strength training workout templates. 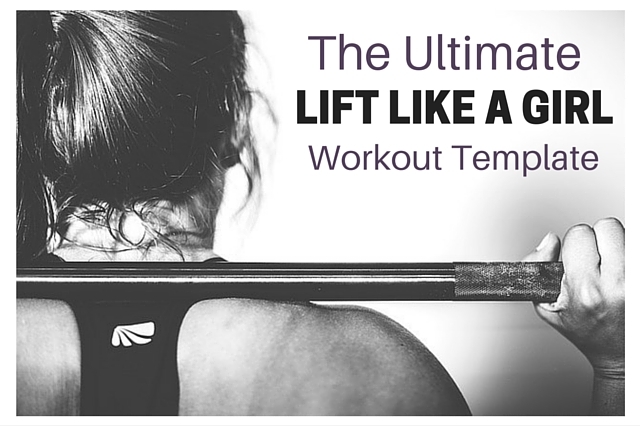 While this ultimate Lift Like a Girl workout template shouldn’t be labeled as a holy grail or top secret program (because, as you know, no such thing exists), it is beautifully effective and versatile. Use this template and follow the accompanying guidelines and you’ll definitely achieve some incredible results. What Is The Ultimate Lift Like a Girl Template? Great question. At its core it’s about simplicity. Not “simple” for the sake of being simple, but because it’s wonderful for those who want to get in the gym, work hard, and then get out and get on with their lives. The longer I’m in the health and fitness world, the more I appreciate the beauty and effectiveness of simplicity. Far too often, many people complicate the hell out of working out. You see people with spreadsheets, calculators, and heart monitors and it takes them half an hour just to set up their workout. One final note. Over the years I’ve been a fan of the 80/20 principle (i.e., that 20 percent of the effort is responsible for 80 percent of the results) and have applied it to damn near every area of my life. Quite simply: do what needs to be done to produce the majority of the results, and forget the rest. Working out is no different. Do what needs to be done to produce the majority of the results and don’t diddle with the rest. That’s what the Lift Like a Girl template is about. Efficiency. Choosing quality over quantity. This is for anyone. Whether you work out at a gym, at home with just your bodyweight, use kettlebells, and everything in between, you can use this template. While anyone can use this template successfully, those who prefer to work hard in a short period of time and don’t want to spend hours per week working out will most enjoy, and appreciate, it. First, let’s look at this template in its most basic, raw form. The Lift Like a Girl Workout Template: perform three exercises (a lower body movement, and an upper body push and pull) for a total of 25-50 reps per exercise. Yes, that’s it. Three exercises each performed for a total of 32 reps (four sets multiplied by eight reps is 32). But don’t let the simplicity fool you. If you use proper exercises (like those shown above) and work hard (use a challenging weight or variation for the provided rep range), you’ll become a believer with the first workout. Just like an ice cream sundae, this Lift Like a Girl workout template comes in dozens of tasty flavors, and you can add various toppings to suite your taste (more on these add-ons in a moment). Now let’s expand on that basic template and make things ever better. To best use the template it’s recommended that you hit all major movements (horizontal and vertical pushing and pulling for the upper body; quad and hip dominant exercises for the lower body) and include a mix of bilateral (using both legs or arms at the same time; e.g., squat or barbell press, respectively) and unilateral (using one leg or arm at a time; e.g., lunge or one arm dumbbell push press, respectively) training in your workouts. This can be accomplished by using four workout formats with the Lift Like a Girl template. The wonderful thing about implementing all four of the workouts above is that you’ll not only hit the major movements, but you’ll include a great mix of unilateral and bilateral training. Now that you have four excellent Lift Like a Girl workout templates (Workouts 1-4 above) this is how you can cycle them into your weekly routine. You can’t go wrong with three workouts per week on nonconsecutive days. Here’s how you’ll rotate the four workouts over the course of two weeks. That short list certainly isn’t exhausted; there are many ways to arrange sets and reps, but those are a few of my favorites. Going back to our ice cream sundae reference, you have a variety of optional add-ons to choose from. Think of it like sprinkling on some nuts or other toppings to a sundae. You don’t need them, but they’re there if you want them. Isolation exercises: maybe you want to work your glutes more or train your abs or arms directly. No problem. After the main workout is complete you can perform isolation exercises (e.g., hip thrusts, biceps curls, triceps extensions, etc.) for about 10 minutes. Interval training: perhaps you want to boost fat loss or improve your conditioning. You can conclude the workout with 5-10 minutes of intervals. Steady-state activity: you can think of this as traditional “cardio” work. You can always wrap up a workout with 10-20 minutes of moderate intensity activity. Now let’s put everything together into a sample program. Want a sample program using the Lift Like a Girl Template? Here you go. Perform three workouts per week on nonconsecutive days, rotating as shown above. *Perform assisted pull-ups if you can’t (yet!) use your bodyweight. Note: when an exercise has a number beside it (1, 2, or 3) perform all sets for that exercise on its own. For example with Workout 4, perform all three sets of deadlifts, then move on to the rest of the workout. When exercises have a number + letter (1a, 1b, or 2a, 2b) perform those exercises as a superset (this is just two exercises) or a circuit (this is three or more exercises). Sticking with Workout 4 as an example, perform exercises 2a and 2b in alternating fashion (perform a set of dumbbell bench presses, perform a set of inverted rows, repeat). Remember that you can plug in the optional add-on work as you please. It’s not mandatory, but you can include it if you’d like. Don’t forget — you must improve your performance, gradually, when possible. Perform more reps with the same weight, increase the weight, or decrease the rest periods between exercises. Improving your performance is a mandatory component if you want to achieve great results. Use the Lift Like a Girl template and sample workouts shown above, and perform them consistently for at least eight weeks and you’ll be a believer too. Please remember what strength training is all about: making you the best version of yourself. These workouts should make you feel great and allow you to appreciate your body for what it can do. Health and fitness is a tool that should make your life better, reduce your stress, and make you feel great about yourself. The above workouts are not about burning as many calories as possible or meant to leave you incredibly fatigued. The workouts are not punishment for overindulging either. Every time you perform the workouts above keep the focus on your performance and what your body can do. Be proud of your physical abilities, and strive to do more. Want done-for-you workouts that use the three-exercise templates shown above that include exercise demonstration videos, printable workout logs, and more? Click here to check out the 3x3x3 Program (a Lift Like a Girl reader favorite).